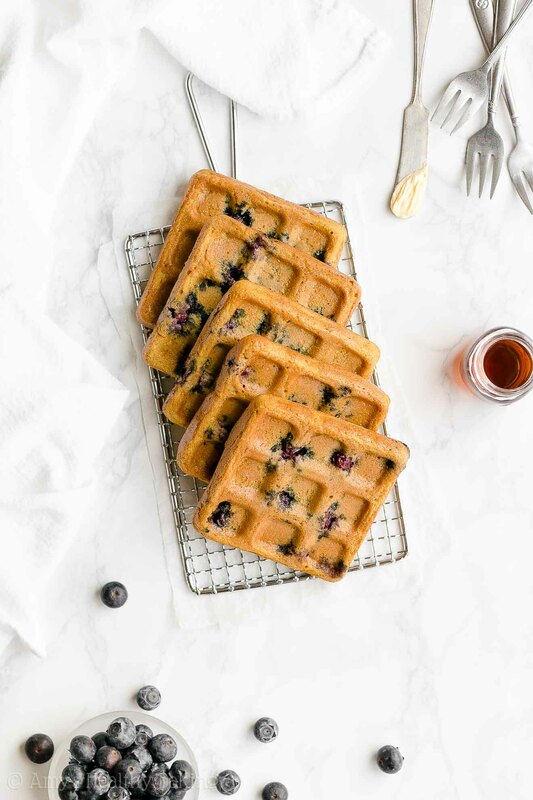 Learn how to make the best ever healthy blueberry waffles from scratch! Only 108 calories! Plus I’m sharing a secret trick that keeps them light and fluffy on the inside yet crispy on the outside! On the final day of my visit to Northern California to see my parents for the holidays, we drove to our favorite brunch spot just under an hour away from their house. Even though we arrived mid-morning, the host still immediately seated us at a table, and as he handed us menus, my mom glanced to her left. The blueberry coffee cake! Towering slices of supremely moist and tender breakfast cake, packed full of fresh juicy berries, topped with sweet cinnamon streusel, and served warm with butter that immediately melts into the decadent cake. As soon as our favorite waiter handed them the gift tin, everyone’s eyes at their table widened in true shock. “Happy holidays!” he smiled, which prompted the woman to whirl around. “Was this you?” she asked. My mom sheepishly nodded, and their entire family thanked us profusely. It’s always fun to spread sweet surprises during the holidays! 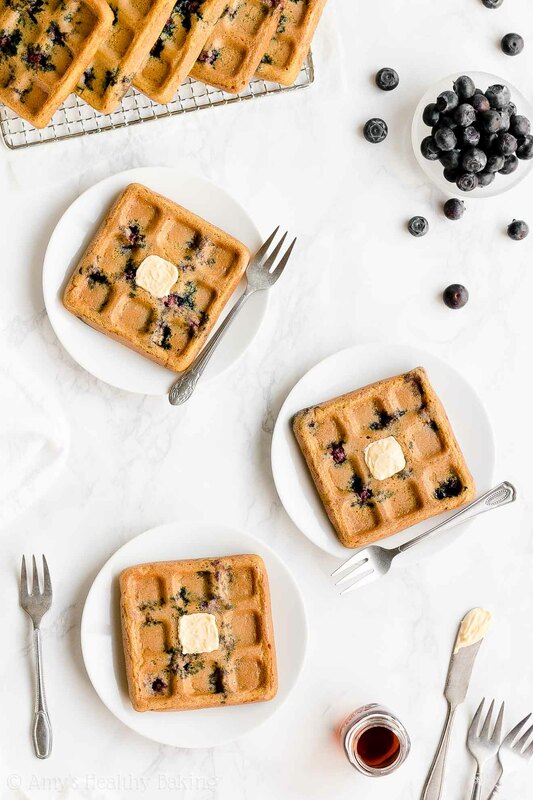 Even though I brought my own individual slice of coffee cake on the plane with me to enjoy back at my own house, I still didn’t get my full blueberry fix… So I decided to add them to one of my favorite homemade breakfasts, which resulted in these Healthy Blueberry Waffles! 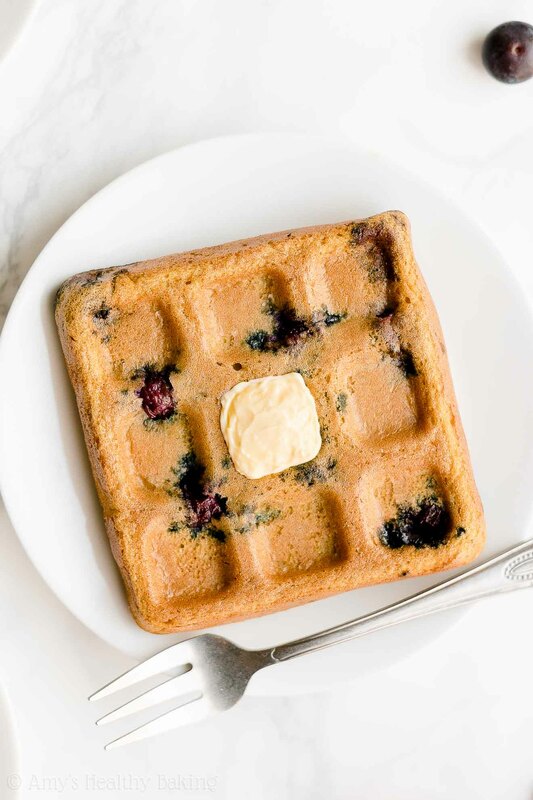 These healthy blueberry waffles are light and fluffy on the inside, crispy on the outside, and full of sweet juicy berries, just like the coffee cake! But unlike that restaurant’s breakfast treat, these contain no refined flour or sugar and just 108 calories! 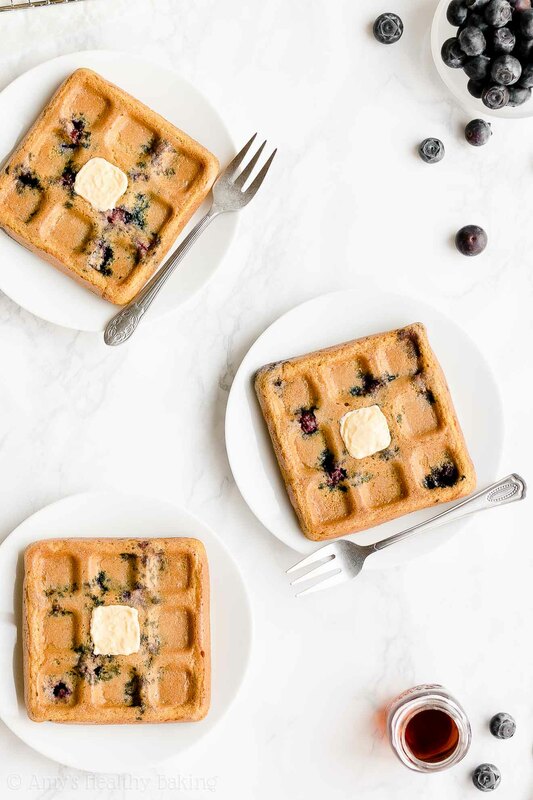 Let’s go over how to make these healthy blueberry waffles! You’ll start with white whole wheat flour. Yes, I know that sounds a bit strange… But I promise such a thing exists, and it’s not just a combination of white (aka all-purpose) flour and whole wheat flour! Instead, white whole wheat flour is made by finely grinding a special type of soft white wheat (hence the name! ), whereas regular whole wheat flour comes from a heartier variety of red wheat. They both have the same health benefits (like extra fiber! ), but white whole wheat flour has a lighter taste and texture. That lets the moist and fluffy texture on the insides of your healthy blueberry waffles truly shine! Next, you’ll whisk in baking soda, baking powder, and salt. You definitely need both baking soda and baking powder! And we’ll get to why in a little bit. I promise! Unlike many traditional waffle recipes that require ¼ to ½ cup of butter (yikes!) for their moist texture on the inside and crispy texture on the outside, you only need 2 teaspoons in this recipe. That really helps keep your healthy blueberry waffles low fat and low calorie! Greek yogurt! Greek yogurt adds the same moisture to your waffle batter as extra butter or oil but for a fraction of the calories, and it also adds a protein boost. I call that a win-win! 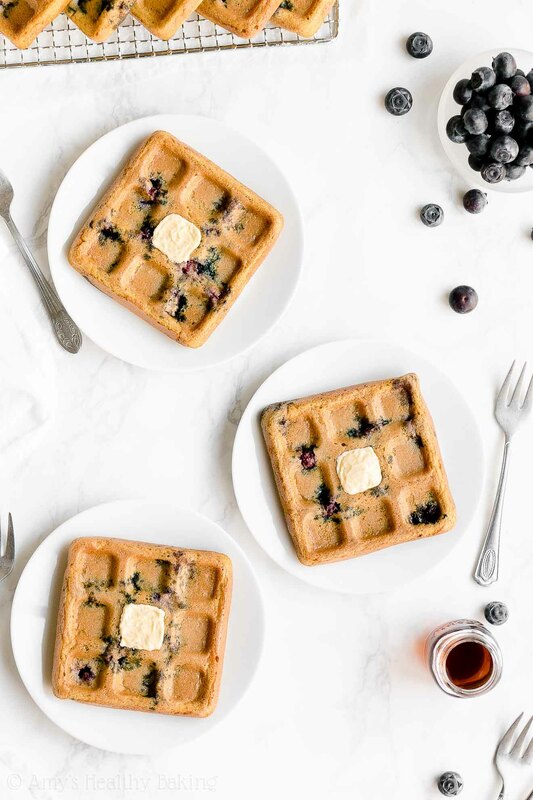 Also unlike traditional recipes that call for refined granulated sugar, you’ll use a bit of pure maple syrup to sweeten your healthy blueberry waffles instead. You want the kind that comes directly from maple trees! The only ingredient on the label should be “pure maple syrup,” and it’s often sold in thin glass bottles or squat plastic jugs (like this!). Tip: I only added a very small amount of maple syrup to my waffle batter because I know my family loves to generously drizzle maple syrup all over their cooked waffles… So mixing more into the batter seemed a little silly! Plain white vinegar! No, I haven’t lost my mind. (Although some people may beg to differ…) The vinegar (an acid) reacts with the baking soda (a base) to create air bubbles. 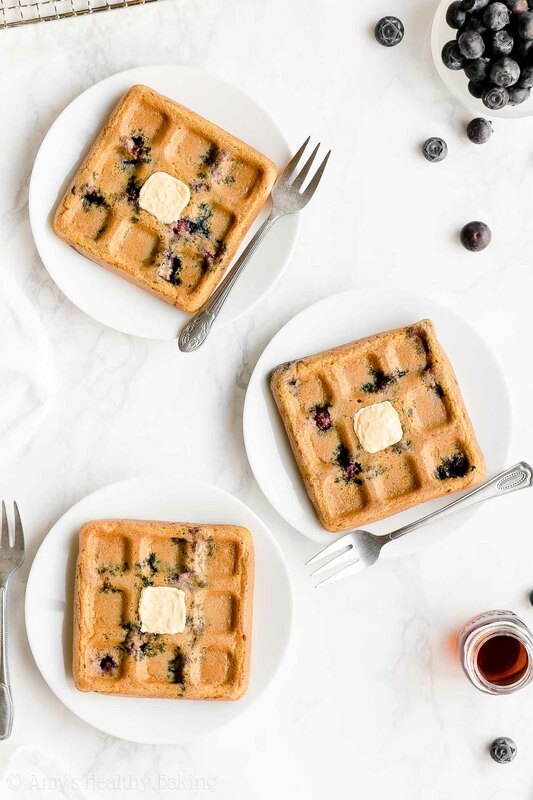 Those air bubbles make your healthy blueberry waffles rise nice and tall, which gives them a lighter and fluffier texture on the inside. I love nerdy baking science like that! And no, I promise you cannot taste the vinegar in your cooked waffles. Pinky swear! Finally, you’ll need one more key ingredient: fresh blueberries! It’s impossible to make healthy blueberry waffles without them, right? 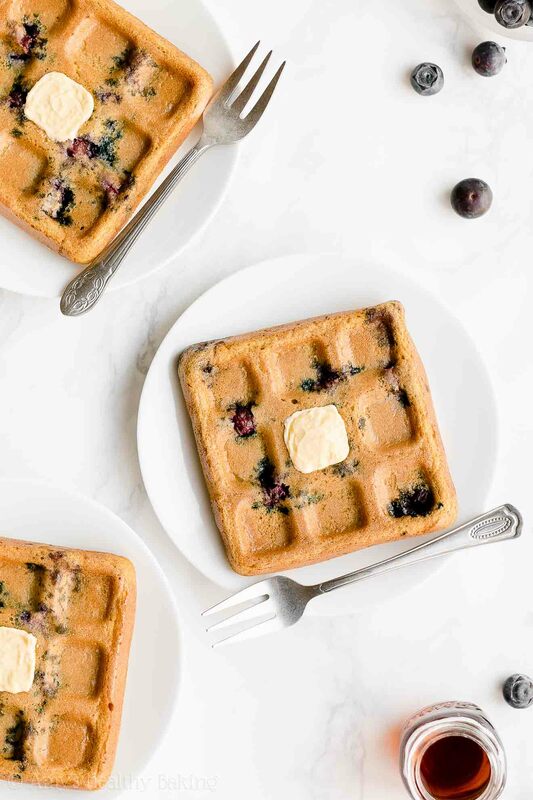 I prefer using fresh ones because they taste a little bit juicier to me and don’t stain the waffle batter gray like frozen blueberries do, but you can still substitute frozen blueberries in a pinch! Waffle pans! You probably thought I was going to say a waffle maker, right? Nope! 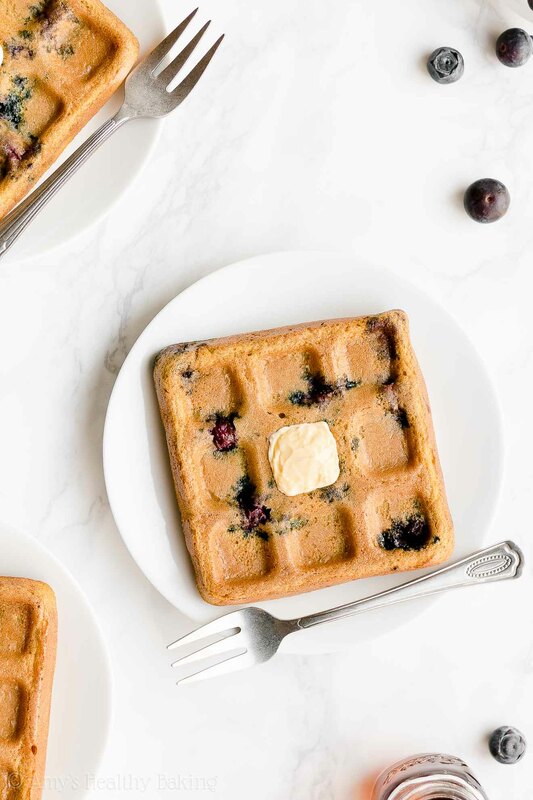 I use these waffle pans to make these healthy blueberry waffles. They’re inexpensive and easy to store, and they work so well! I usually avoid buying “one use” pans, but these are worth every penny because they yield the thickest and fluffiest waffles I’ve ever eaten! Hint: I specifically designed this waffle batter and recipe for baking in waffle pans. When made with a waffle iron, the waffles don’t turn out quite as well, but I go over how to solve that in the Notes section of the recipe! 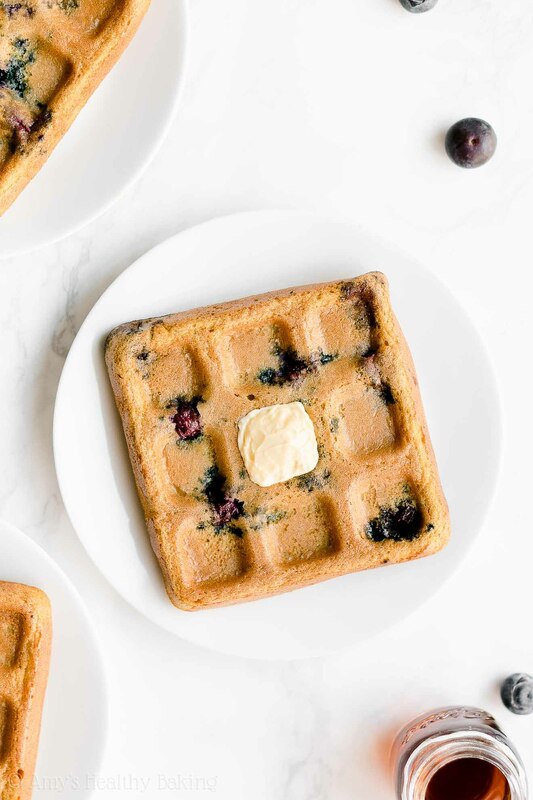 This just might be the most important part of this healthy blueberry waffle recipe… You actually need to complete one more step in between when your waffles finish baking and before you eat them! I popped my waffles in the toaster oven! 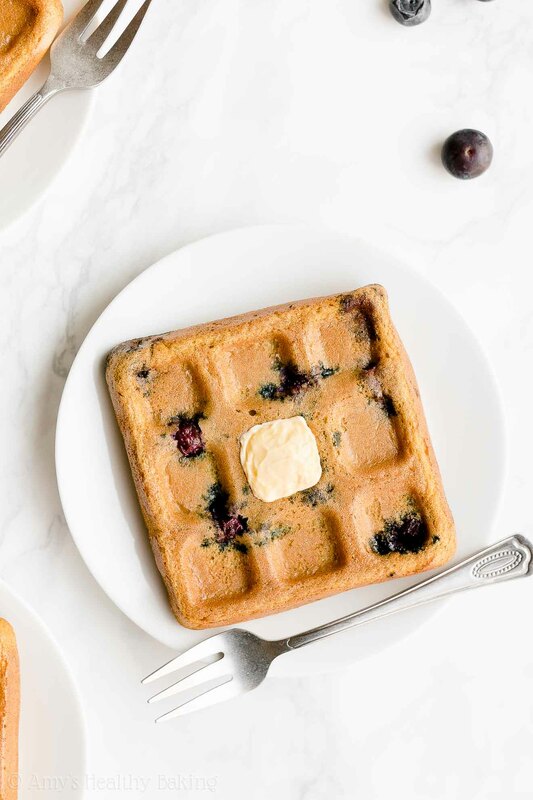 Just like the frozen waffles I grew up eating, when you toast these healthy blueberry waffles for a little bit, they get that perfectly crisp and crunchy texture on the outside, while still maintaining their moist and fluffy texture on the inside. I promise it’s worth every second of impatiently waiting for them to toast! That definitely looks like true waffle bliss to me! And when you make your own, remember to snap a picture and share it on Instagram using #amyshealthybaking and tagging @amyshealthybaking IN the photo itself! (That guarantees I’ll see your picture! ?) I’d love to see your healthy blueberry waffles! This recipe is a true family favorite! 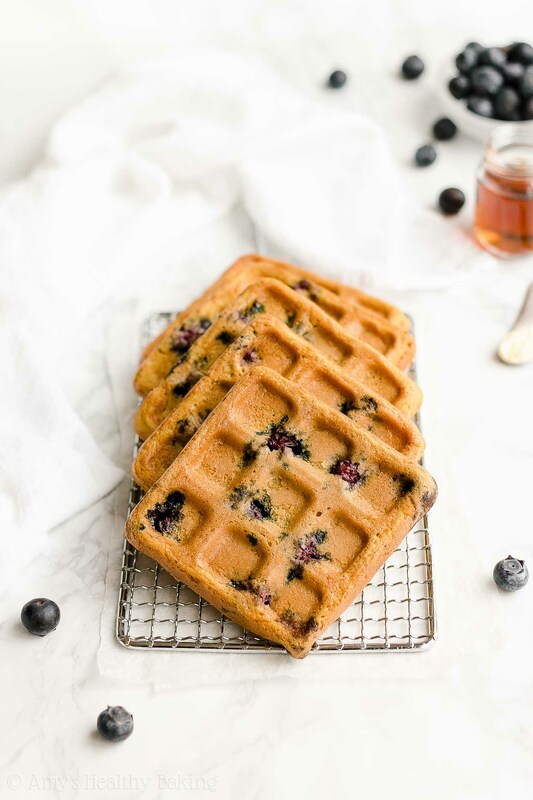 These waffles are moist and fluffy on the inside, crisp and crunchy on the outside, and full of sweet juicy blueberries. They’re perfect for lazy weekend brunches or even meal prepping! Leftovers will keep for at least five days if stored in an airtight container in the refrigerator, and they also freeze really well. Preheat the oven to 350°F, and generously coat 2 waffle pans with nonstick cooking spray. Divide the batter between the prepared waffle pans, and spread the batter out with a spatula. (It doesn’t spread on its own!) Bake at 350°F for 13-16 minutes or until the centers feel firm to the touch and a toothpick inserted into the center comes out clean or with a few crumbs attached. Cool in the pan for 10 minutes before transferring to a wire rack. FOR WAFFLES WITH CRISPY OUTSIDES: Let the waffles cool completely to room temperature. Toast individual waffles in a toaster oven until deep golden brown on the outside. Notes: For the gluten-free flour, I recommend the following: 1 cup (120g) millet flour, ¾ cup (90g) tapioca flour, ½ cup (60g) brown rice flour, and 1 ½ teaspoons xanthan gum. Most store-bought gluten-free flour blends (like this one!) will also work, if measured like this. It’s very important to measure the flour correctly, using this method or a kitchen scale. (← That’s the one I own!) Too much flour will make your waffles dry. Any oil will work in place of the butter or coconut oil. I prefer my waffles on the not-very-sweet side because I know how much syrup my family drizzles on theirs before eating! If you prefer sweeter waffles, you can substitute 2-4 tablespoons of pure maple syrup, honey, or agave for an equal amount of water. Do not omit or substitute for the vinegar! It’s absolutely required. It reacts with the baking soda to make your waffles rise better and end up with a more tender texture. The vinegar flavor completely disappears after baking—I promise! I prefer fresh blueberries because they taste a little juicier and don’t stain the waffle batter gray, like frozen ones do. 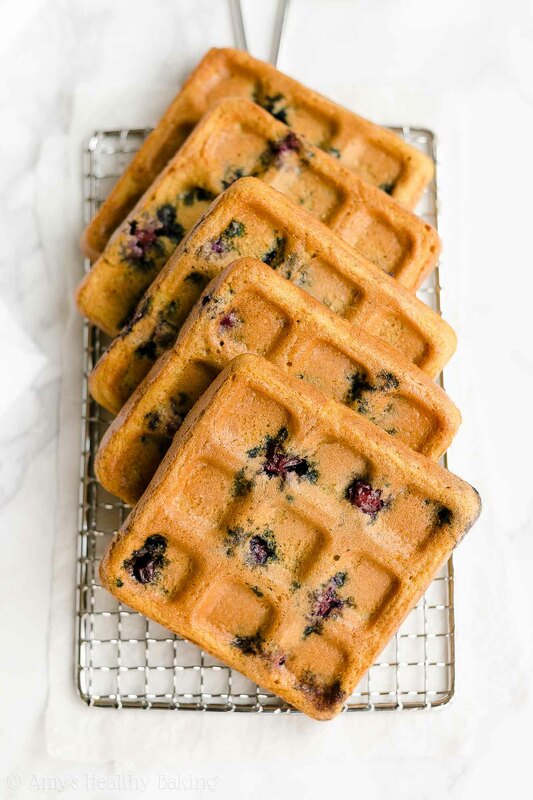 In a pinch, you may substitute frozen blueberries, but your waffles may take an extra minute or two to bake. These are the waffle pans that I use. They’re totally affordable and worth every penny! I baked waffles at least once a week for two months straight, and the pans still acted like they were as good as new! The blueberries will most likely poke up out of the batter after you’ve spread the batter into the waffle pans. That’s fine! The batter will rise up and completely engulf the blueberries after baking. Make sure to generously coat your waffle pans with cooking spray! The blueberries release juice as the waffles bake, and the juice can make the waffles stick more to the pans if you don’t spray them well. This recipe was specifically designed for baking. You can use the batter in a traditional waffle iron, but the waffles will turn out more limp and soggy compared to the thick, firm, and fluffy baked waffles. If making the waffles in a regular waffle iron, do NOT skip Step 4 for crispy waffles—it makes a HUGE difference in the final waffle texture! Toasting your waffle iron waffles will make them much firmer, rather than limp and soggy! I do NOT recommend skipping Step 4! It makes a HUGE difference in the waffles’ texture! Without it, your waffles will be fluffy and tender, but they won’t have crispy outsides. You can easily toast leftover waffles straight from the refrigerator, too! This recipe is easily halved, if needed! For more information, please read through the “Nerd Alerts” in my blog post above! Hi Beautiful Girl, I have just made these and they are amazing! A big thing over here, at the moment, is Michael Mosley’s Fast800 diet. It’s a way of eating which has been scientifically endorsed to help assist with weight loss and accredited by many seriously worthy institutions. I LOVE waffles … and for me your recipe is a game changer! I can slot them into my Fast800 with NO problems … and a doddle to include into the ‘follow on diet’ – The 5:2. So I never had blueberry waffles before and it sounds amazing! Hi. I have celiac. This website is so amazing because it gives you do many gluten free options. I have known about this since 5th grade I believe. I am making this recipe for a brunch banquet for my work. I am sure everyone is going to love them! Thank you ! I’m truly honored that you plan on baking these for your work’s brunch banquet! That means the world to me! 🙂 I can’t wait to hear what you thought of them Cassie! I’m so glad everyone loved them! And thank you so much for your kind words about my website — that means so much to me Cassie! 🙂 I haven’t personally tried other fruits, but I’m guessing that should work. At the very least, diced strawberries and raspberries will! (And no stupid questions exist here!!) I’d love to hear what you think if you try subbing other fruit! I took your suggestion and tried the strawberrys in replace of the blueberries. It turned out very well. Thank you for everything you do and for always answering my questions!